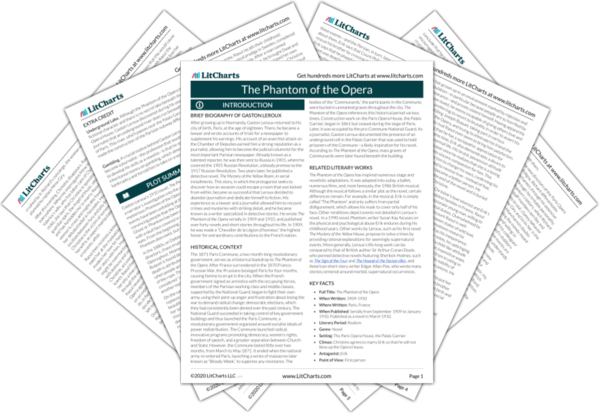 Instant downloads of all 945 LitChart PDFs (including The Phantom of the Opera). 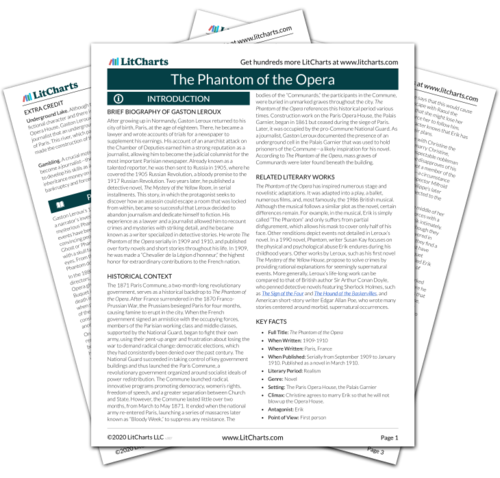 Welcome to the LitCharts study guide on Gaston Leroux's The Phantom of the Opera. Created by the original team behind SparkNotes, LitCharts are the world's best literature guides. A concise biography of Gaston Leroux plus historical and literary context for The Phantom of the Opera. A quick-reference summary: The Phantom of the Opera on a single page. In-depth summary and analysis of every chapter of The Phantom of the Opera. Visual theme-tracking, too. Explanations, analysis, and visualizations of The Phantom of the Opera's themes. The Phantom of the Opera's important quotes, sortable by theme, character, or chapter. Description, analysis, and timelines for The Phantom of the Opera's characters. Explanations of The Phantom of the Opera's symbols, and tracking of where they appear. An interactive data visualization of The Phantom of the Opera's plot and themes. After growing up in Normandy, Gaston Leroux returned to his city of birth, Paris, at the age of eighteen. There, he became a lawyer and wrote accounts of trials for a newspaper to supplement his earnings. His account of an anarchist attack on the Chamber of Deputies earned him a strong reputation as a journalist, allowing him to become the judicial columnist for the most important Parisian newspaper. Already known as a talented reporter, he was then sent to Russia in 1905, where he covered the 1905 Russian Revolution, a bloody premise to the 1917 Russian Revolution. Two years later, he published a detective novel, The Mystery of the Yellow Room, in serial installments. This story, in which the protagonist seeks to discover how an assassin could escape a room that was locked from within, became so successful that Leroux decided to abandon journalism and dedicate himself to fiction. His experience as a lawyer and a journalist allowed him to recount crimes and mysteries with striking detail, and he became known as a writer specialized in detective stories. He wrote The Phantom of the Opera serially in 1909 and 1910, and published over forty novels and short stories throughout his life. In 1909, he was made a “Chevalier de la Légion d’honneur,” the highest honor for extraordinary contributions to the French nation. 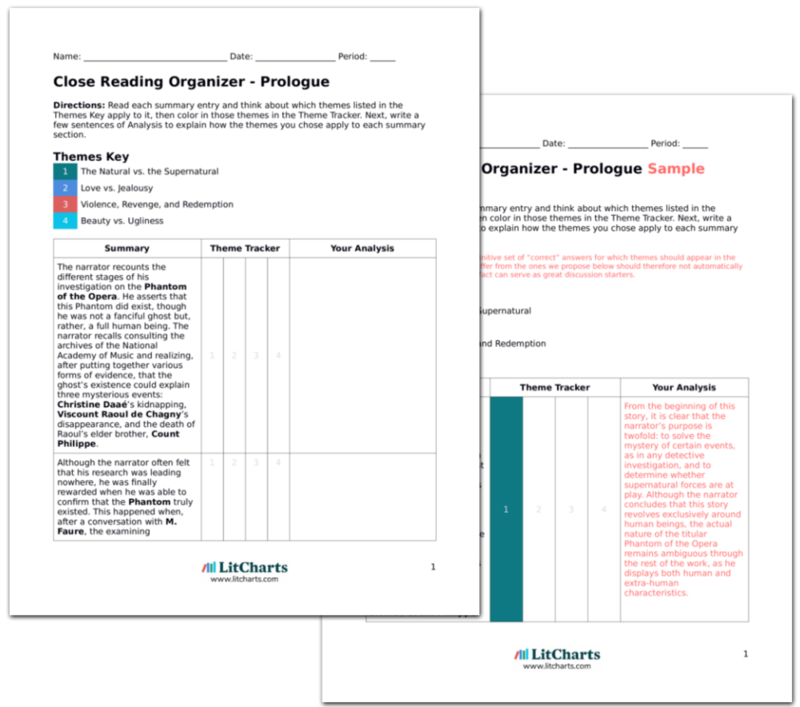 Get the entire The Phantom of the Opera LitChart as a printable PDF. The 1871 Paris Commune, a two-month-long revolutionary government, serves as a historical backdrop to The Phantom of the Opera. After France surrendered in the 1870 Franco-Prussian War, the Prussians besieged Paris for four months, causing famine to erupt in the city. When the French government signed an armistice with the occupying forces, members of the Parisian working class and middle classes, supported by the National Guard, began to fight their own army, using their pent-up anger and frustration about losing the war to demand radical change: democratic elections, which they had consistently been denied over the past century. The National Guard succeeded in taking control of key government buildings and thus launched the Paris Commune, a revolutionary government organized around socialist ideals of power redistribution. The Commune launched radical, innovative programs promoting democracy, women’s rights, freedom of speech, and a greater separation between Church and State. However, the Commune lasted little over two months, from March to May 1871. It ended when the national army re-entered Paris, launching a series of massacres later known as “Bloody Week,” to suppress any resistance. The bodies of the “Communards,” the participants in the Commune, were buried in unmarked graves throughout the city. The Phantom of the Opera references this historical period various times. Construction work on the Paris Opera House, the Palais Garnier, began in 1861 but ceased during the siege of Paris. Later, it was occupied by the pro-Commune National Guard. As a journalist, Gaston Leroux documented the presence of an underground cell in the Palais Garnier that was used to hold prisoners of the Commune—a likely inspiration for his novel. According to The Phantom of the Opera, mass graves of Communards were later found beneath the building. The Phantom of the Opera has inspired numerous stage and novelistic adaptations. It was adapted into a play, a ballet, numerous films, and, most famously, the 1986 British musical. Although the musical follows a similar plot as the novel, certain differences remain. For example, in the musical, Erik is simply called “The Phantom” and only suffers from partial disfigurement, which allows his mask to cover only half of his face. Other renditions depict events not detailed in Leroux’s novel. In a 1990 novel, Phantom, writer Susan Kay focuses on the physical and psychological abuse Erik endures during his childhood years. Other works by Leroux, such as his first novel The Mystery of the Yellow House, propose to solve crimes by providing rational explanations for seemingly supernatural events. More generally, Leroux’s life-long work can be compared to that of British author Sir Arthur Conan Doyle, who penned detective novels featuring Sherlock Holmes, such as The Sign of the Four and The Hound of the Baskervilles, and American short-story writer Edgar Allan Poe, who wrote many stories centered around morbid, supernatural occurrences. When Published: Serially from September 1909 to January 1910. Published as a novel in March 1910. Climax: Christine agrees to marry Erik so that he will not blow up the Opera House. Underground Lake. Although the Phantom of the Opera is a fictional character and there is no secret lake beneath the Paris Opera House, Gaston Leroux discovered during his years as a journalist that an underground river does run beneath the city of Paris. This river, which passes near the Palais Garnier, even made the construction of the Parisian subway difficult. Gambling. A crucial motive behind Gaston Leroux’s decision to become a journalist—the profession that would later lead him to develop his skills as a novelist—is that he spent all of his inheritance money on gambling, which almost led him to bankruptcy and forced him to take on a second job. Legros, Christine. "The Phantom of the Opera." LitCharts. LitCharts LLC, 2 Apr 2019. Web. 23 Apr 2019. Legros, Christine. "The Phantom of the Opera." LitCharts LLC, April 2, 2019. Retrieved April 23, 2019. https://www.litcharts.com/lit/the-phantom-of-the-opera.